The paint job on Zipporah Lisle-Mainwaring’s London townhouse certainly makes a statement. According to her neighbors, that statement is meant as an over-the-top slight against them. 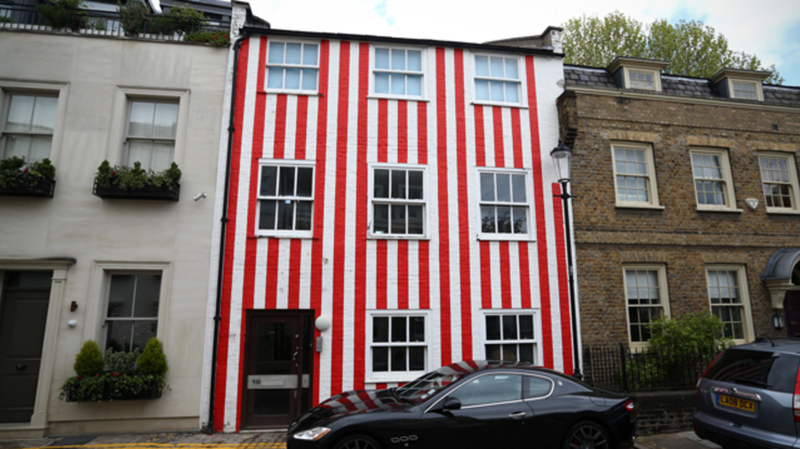 Whether or not that was Lisle-Mainwaring’s intention, a London court has ruled that she’s allowed to keep the candy-striped house the way it is, The Guardian reports. The conflict began when the neighborhood forbid Lisle-Mainwaring from tearing down her house, which she uses for storage, and building a new one in its place. The red-and-white stripes appeared on the facade in March 2015 and The Royal Borough of Kensington and Chelsea demanded that she repaint “all external paintwork located on the front elevation” shortly thereafter. The notice, which was served under the UK’s Town and Country Planning Act of 1990, said that the “stripes on the front elevation, [are] incongruous with the streetscape of South End and the local area.” Instead of painting over the stripes within 28 days as the notice required, Lisle-Mainwaring took the matter to court.